Chris Blake has been writing professionally since 2007. He holds a Bachelor of Arts in English and political science from West Virginia Wesleyan College. He works and coaches high school basketball in Washington, DC. As a basketball player, you have likely dreamed of throwing down a monster dunk. Sports highlights are filled with spectacular dunks by high-flying basketball players who make it look easy. 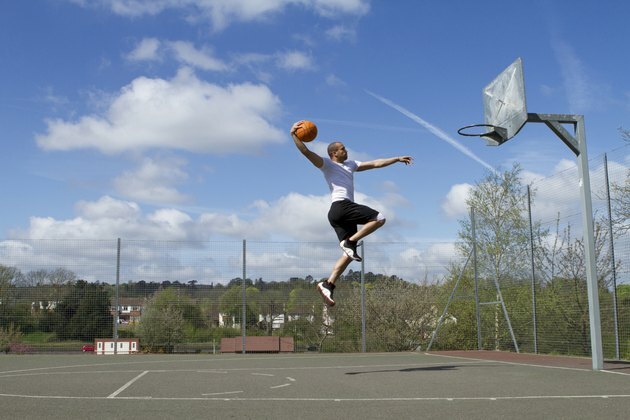 While genetics sometimes plays a part, dunking a basketball requires great physical strength and mental training. Touching the net is a great start, but a standard net hangs 15 inches lower than the rim so you will have to add several inches to your vertical jump in order to slam dunk. Since the net hangs significantly lower than the rim, it is much easier to touch the net than it is to dunk a basketball. A workout plan that includes plyometric exercises -- such as squats, lunges, rope jumping, backboard touches and wall sits -- will help build fast-twitch muscles which are responsible for explosiveness and will help you get higher off the ground more quickly. Develop a routine that you can use three times a week to build muscles in your legs, hips and back so that you can ultimately slam dunk. As a beginner, one-handed dunks are often easier than two-handed dunks, which require more lift and explosiveness. Even if you work hard to improve your vertical enough to go from touching the net to grabbing the rim, a one-handed dunk requires the fingertip strength to palm the basketball. Fingertip strength is often the most overlooked facet of the game of basketball, but is vital to being able to control the ball while dribbling, shooting and dunking. Incorporate fingertip push-ups into your workout to quickly and effectively build fingertip strength and make palming the basketball easier. If you are consistently working out core muscle groups required to dunk a basketball, your vertical leap will improve to the point that you can get over the rim. Timing your lift-off in relation to where you are on the basketball court is difficult without practice. Utilize a tennis ball or a volleyball, which are both smaller than basketballs, to work on the proper footwork needed to dunk. If you don't get the timing down, you may find yourself shuffling your feet to adjust your position and losing power on your jump or turning the ball over. Getting stronger and practicing can also have an impact on your mental well-being and your confidence. Sometimes, the mental aspect can be even more important than the physical. Many players have the strength to dunk a basketball as they continue to develop and mature, but are unable to envision themselves jumping high enough to dunk. This inability to overcome the mental hurdles necessary to be a high flier can hinder your ability to dunk. Belief in your ability and envisioning yourself getting off the ground can go a long way when it comes to dunking a basketball.